WOLFRAM-Avocat strives, insofar as possible, to present accurate and complete information on this website. However, the firm cannot guarantee the timeliness, accuracy and/or completeness of the information contained on this website. WOLFRAM-Avocat may not in any case be held liable for any direct, remote, immaterial, or consequential damage of any kind whatsoever arising from an impossibility to use or access the site or from the utilisation by the User of the information, data, or publications contained thereon. 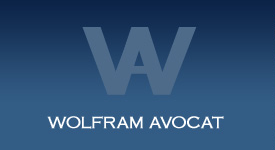 WOLFRAM-Avocat reserve the right to modify and/or add to the information contained on this website, without advance notice. The content of this website is protected by copyright. Any reproduction or communication of this site’s content requires the prior written consent of the persons referred to in the legal notice. The legal information contained on this website does not, under any circumstances, constitute an online legal consultation, and does not in no way replace legal consultation with a lawyer as specificities and characteristics are unique to each case. Messages addressed to Mr Wolfram or any member of his office by electronic mail does not imply contracting and will not incur the responsibility of either Mr Wolfram or any member of his office or any of its members, particularly regarding any procedure or litigation deadlines.